Main Setlist: Caroline, Paper Plane, Hold you Back, Rain, Looking Out for Caroline, GoGoGo, Rock'n' Roll'n' You, Beginning of The End, Proposin' Medley incl. What You're Proposin', Down The Dustpipe, Wild Side of life, Railroad, Again and Again, Big Fat Mama, The Oriental, Creepin' Up On You, In The Army Now, Drum Solo, Roll over lay Down, Down Down, Whatever You Want, Rockin'all over the World, Rock'n Roll Music / Bye Bye Johnny. Tour Crew: Glen Smith (Tour Manager), Lyane Ngan (Band Personal Assistant), Pat Marks (Lightning Director 2013), Ewan Cameron (Lightning Director 2014), Andy May (FOH Sound Engineer), Tim Franklin (Monitor Engineer), Lloyd Gilbert (Guitar Tech), Andy Tomkins (Keyboard / Bass Tech), Lance Miles (Drum Tech) Merchandiser: Global Merchandising Services Ltd. Management: DurocMedia Ltd. Manager: Simon Porter. 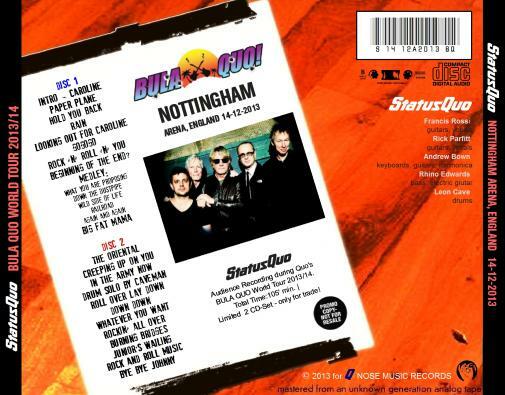 Additional / Unusual songs performed: Junior's Wailing, Burning Brideges (UK extra track in the encore and at Workshop Clumber Park,Uk 15.8.2014) and a full version of Bye Bye Johnny, Don't Waste My Time (15.8.2014 at Workshop Clumber Park,UK with Freddy Edwards on guitar), Creepin' up On You (Lead vocals by Rhino Edwards 15.8.2014 at Workshop Clumber Park,UK) and Whatever You Want (Lead vocals by Andy Bown at Workshop Clumber Park 15.8.2014). Tour Notes: Again no drastic changes in the setlist. Bula, Bula! 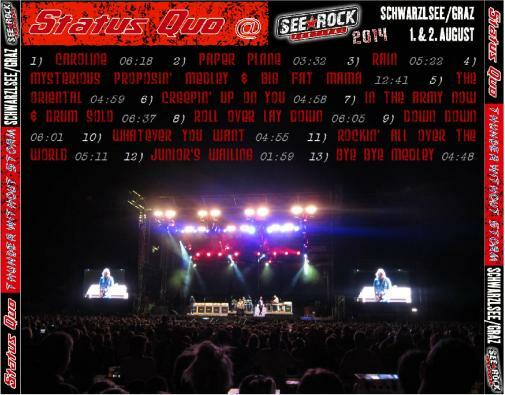 The 2014 shows in Pula 2.8., Monte Carl 4.8., Schaffhausen 6.8., Biel 7.8., Tettnang 9.8. and Dautphe 10.8. were cancelled (Rick was ill-taken to hospital in Pula, Croatia on early saturday morning, after the band arrived Pula). 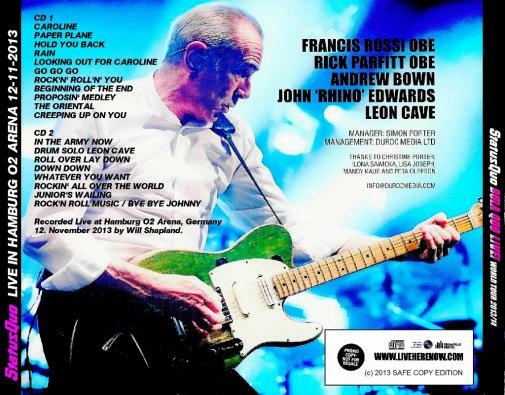 Note: The shows from Hamburg & London are available on CD and for download from Abbey Road Live Here Now. Get the official live recordings from www.liveherenow.com - Now! 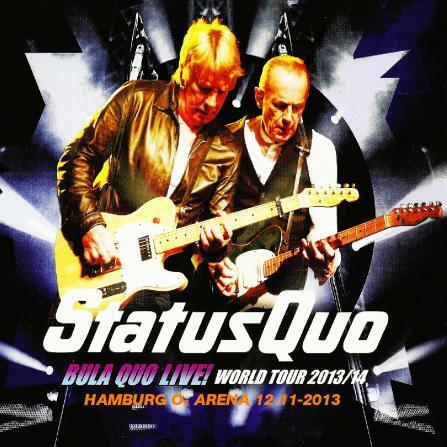 12.11.2013 - Abbey Road Live Here Now will be recording two shows (Hamburg and London) from the Bula Quo Tour on CD and mp3 download. 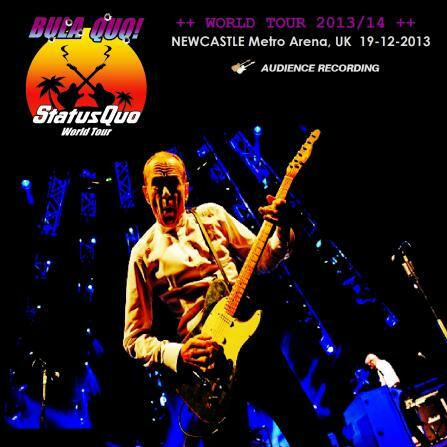 19.12.2013 - After 24 years as Quo's Lightning Designer (starting on the Perfect Remedy Tour 1989), it's Patrick Marks last show for the band at Newcastle Metro Arena.04.05.2014 - Quo were today special guests at FC Schalke 04 annual general assembly. A total 0f over 7000 Schalke members gathered on Member's Day to celebrate the club's 110th anniversary. 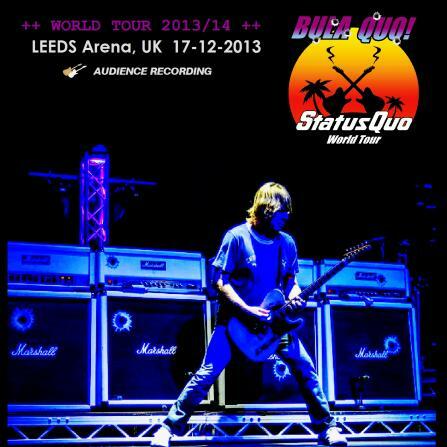 Quo played a 40 minutes Set and it was a kind of private gig. The band startet their show around 12.30h. The setlist: Caroline, Medley, Big Fat Mama, In The Army Now, Roll over lay Down, Down Down, Whatever You want (the club's anthem before the home team went on the pitch) and Rockin' all over the World. 02.08.2014 - Press release! 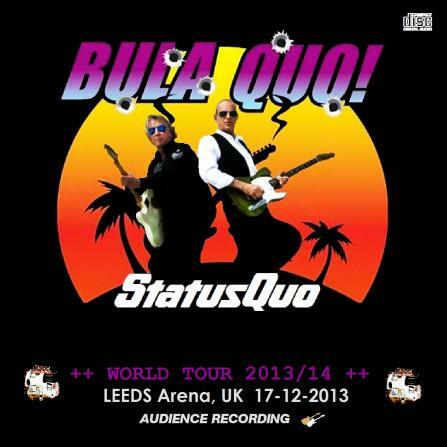 Status Quo have been forced to cancel a series of concerts. 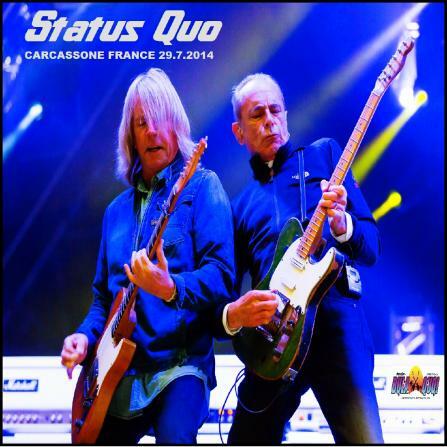 Guitarist Rick Parfitt was taken ill overnight (Friday - after the Graz gig) and has been taken to hospital in Pula (Croatia) where he was detained overnight. Therefore tonight's show in Pula and the dates in Monte Carlo, Switzerland and Germany - up until the 10th August – have been cancelled on medical advice. 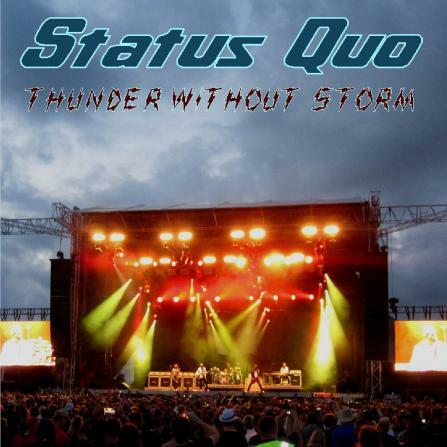 The band’s manager Simon Porter said, "The band do not cancel shows lightly, as any of our fans will tell you, but in this instance we have no option but to follow medical advice." 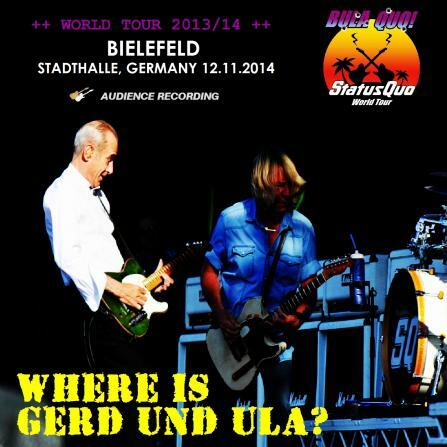 15.08.2014 - First time in 47 years that the band is performing a show WITHOUT Rick Parfitt. 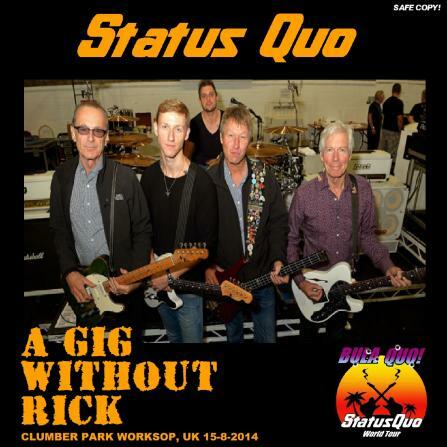 Substitute will be Freddie Edwards at the show in Clumber Park - Worksop (UK). Freddie is the son of Quos bass man and he played on Francis Rossis solo gigs. 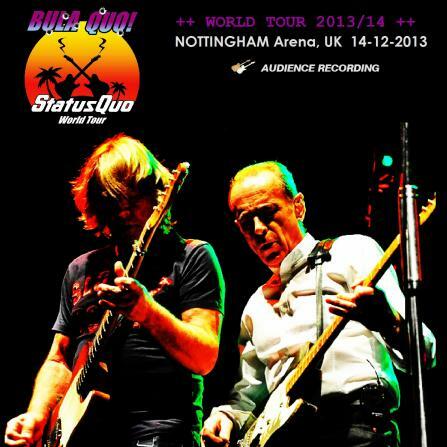 Rick Parfitt recommended that he will be on stage at Quos Show on the 23rd August in Holkham Park, Norfolk.